The Fairchild 91, (a.k.a. A-942), was a small flying boat airliner developed in the United states in the mid-1930s. Fairchild designed the aircraft in response to a Pan American Airways request for a small flying boat to operate on their river routes along the Amazon and Yangtze. The result was a conventional high-wing cantilever monoplane with its radial engine mounted above the wing in a streamlined nacelle. Before construction of the prototype was complete, however, Pan Am no longer required the aircraft to operate in China, and Fairchild modified the design to optimise it for the tropical conditions of Brazil. After the first two aircraft were delivered, Pan Am cancelled the remaining four aircraft on its order, discovering that the two aircraft they had already purchased were capable of handling their entire Amazon River demand; the Model 91 had become a victim of its own success. Fairchild completed one more airframe under the designation A-942-A. The sole A-942-B was specially built for the American Museum of Natural History [regn. no. NR777], to be used by naturalist Richard Archbold on his second expedition to New Guinea in 1936-37. The prototype was sold to the Spanish Republican Air Force, but was captured by the Spanish Nationalists and was used by them until 1938. 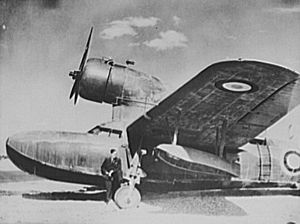 One of the privately-owned A-942s served with the RAF in Egypt for a time. Note: Some sources state that seven aircraft were built ,but this is incorrect, probably brought about by confusion due to the frequent changes in engine installations. Fairchild 91 Baby Clipper The initial version built to a Pan Am specification for use on River based sectors, initially powered by a 750hp Pratt & Whitney S2EG Hornet. Three built,[NC14743 (prototype with retractable wing floats, and Zap flaps), NC14744 = PP-PAP, NC15952 = PP-PAT]. Fairchild A-942-A Alternative designation for the Fairchild 91 Fairchild 91B Jungle Clipper Specially equipped for NYC Museum of Natural History, initially powered by a 700hp Wright F-52 Cyclone. One built,[NR777]. Fairchild A-942-B Alternative designation for the Fairchild 91B.